With clear, internationally understandable pictograms, the guide signage range communicates information and therefore facilitates orientation within the building. The signage Range can be used in many varied ways. The picture symbols used were designed by Otl Aicher. The signage range includes a large selection of pictograms. The symbol range is continuously developed further, to adapt it to new circumstances and applications. guide can be used to realise a detailed guide and orientation system. The signage symbols are tactile. 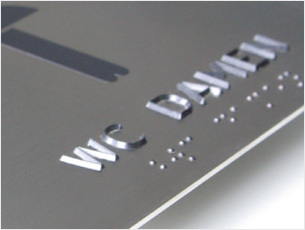 It is also possible to attach Braille and profiled lettering. Information signs in tactile graspable lettering make an important contribution to enable people with sensory impairments to also orientate themselves within the building and therefore to ensure their independence. Profiled lettering can be perceived both tactilely and visually. The letters and symbols are represented as three-dimensional prisms and can therefore be felt and read. A clearly contrasting design can be achieved through lettering size and suitable choice of colour.